http://www.pref.miyagi.jp/bijyutu/museum/, some of which have a connection with Miyagi Prefecture and the Tohoku region of Japan. 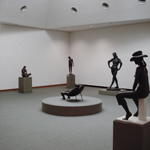 The collection also includes the Western art including works by Wassily Kandinsky and Paul Klee. 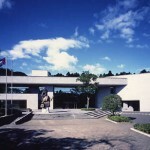 In June 1990, the Churyo Sato Gallery was opened to the next of the west side of main building. The museum was designed by Kunio Maekawa (1905-1986) who has studied with Le Corbusier and lead the Japanese modernism after the world war II. 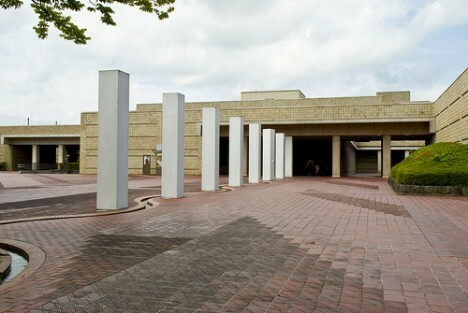 Based on the idea of columns for buildings, the white 8-piece work Ma’ayan (1995) was built at the front of the main building, which were made by Dani Karavan. There displays Henri Moore’s Large Spindle Piece (1963-74) at the front garden. The Museum strives to be an “open museum”, not only for admiring art, but also to learn art through various interactive activities. To achieve this goal, the Museum holds workshops which are open to anyone who wants to draw, print, do pottery, sculpt and so on. There are machines and equipment for working with wood, metal and clay. Staff members of the museum are available to provide assistance.